Botany is a suburb with extensive commercial development centred on shipping and freight. This industrial area also includes commercial and residential zones. Randwick Electrical Services is proud to serve the diverse needs of this mixed-use neighbourhood. Finding electrical faults ahead of time can eliminate major problems and expenses down the road. Our qualified technicians take all the necessary steps to ensure that your business or residence is not only safe but running in optimal condition. These steps include collecting evidence, analysing evidence, locating faults, determining and repairing causes, and then running safety checks. If you suspect electrical faults in your home or workplace in Botany, call Randwick ASAP. If you run a business, there’s a good chance that you depend on various electronic devices to get through the day. However, if your switchboards and safety switches are out of date, expensive electronic equipment and gadgets may be at risk of an unexpected power surge. Talk to one of our experts and find out if you need to upgrade your switchboards. Don’t lose money over damaged electronics! Especially if your building is older, having the switchboards inspected is a responsible choice. It can save you money (and stress) in the future. Switching to solar power is a smart option for your home or business. After the initial investment, solar panels provide decades of energy independence. In certain situations, government grants are available to help you meet your clean energy goals. Randwick Electrical Services only installs high-performance panels that meet the standards set forth by The Clean Energy Regulator (government) standards. We protect and encourage solar consumers in Australia. 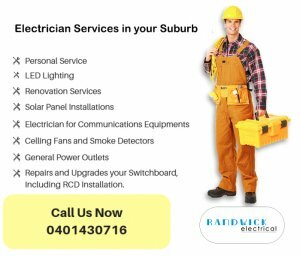 If you need an emergency electrician in Botany, Randwick Electrical provides 24/7 emergency service. We’re just a call away. Our employees are friendly do well under pressure. We never take shortcuts—even in an emergency! Instead, we get the job done properly. When there’s a stressful situation, let us get everything back in order.